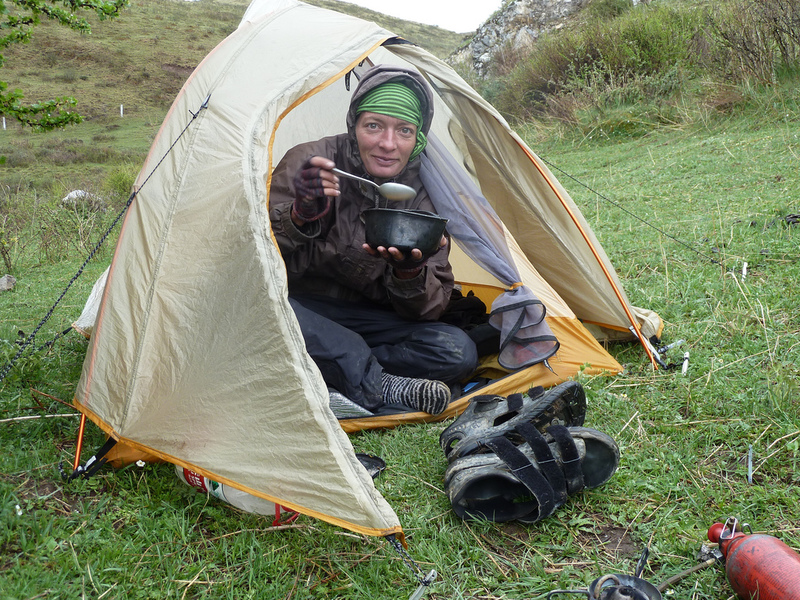 Solo Female Cycling Around the World: Rags To Riches...What's The Best Tent For Bicycle Touring? “Is that tent supposed to look that way” The campground manager says with a curious WTF sort of tone. I am tucked inside a claustrophobic cocoon of what remains of my mountain hardware 2.1 skyledge tent trying not to laugh. However, the broken rake that I propped under one of two sewn up zipper doors in order to combat last nights rain is just too much of a site for my sarcasm. 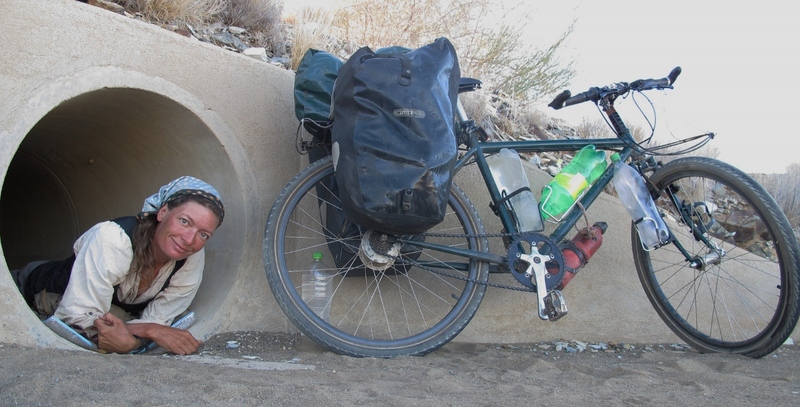 “The longer I cycle tour, the less these things seem to matter” I chuckle from inside as I attempt to unsuccessfully sit up straight under the broken poles, contort my body into a pretzel shape and crawl out the permanently open zipper door. This is sort'a normal isn't I think to myself as I stand up in the sand and straighten my new hay stack haircut, a frazzled homemade mess of locks resembling Cramer's from Seinfeld. People like me really shouldn't be allowed access to scissors. I think to myself as I run my fingers through my botched attempt at cutting off my own sun-baked hair. Despite looking like a disheveled eighties rocker and feeling vain for the first time in a long while, I chuckle “I got lucky” as the managers well meaning concern for my lack of shelter forms a worried uncomfortable grimace across his hardly 20 year old innocent face. 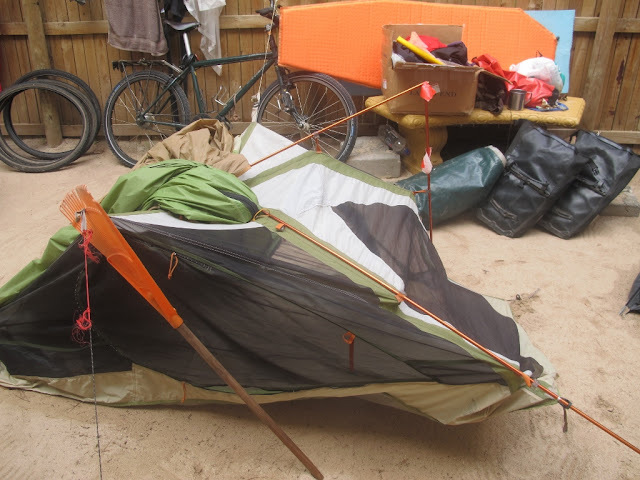 “I was given a new Hilleberg Jannu tent under sponsorship, it is coming in the mail, it will be here soon, I'm gonna crew on a sailboat across the Atlantic from Namibia up the Brazilian coast, then cycle the Americas to finish the cycling around the world thing. The tent will be perfect..from rags to riches, baby” I chuckle, feeling the glow of immense gratitude knowing Hilleberg The Tentmakers's reputation as one of the best quality tent companies in the world. “Have you had a tent like that before?” The young manager asks looking far less concerned with my 'who needs all the 'right' gear anyway, just go with what you got' attitude. The same attitude that stop bothering to use a tent and started happily sleeping under the stars or road out of the wind instead. The young sleepy manager asks, his orange hoody is pulled loosely over his uncombed hair. The cloudy morning sky suggests there is more rain to come. I am standing next to my new tent proudly grinning. I am pondering how a TENT got to be so puuuurdy while debating if being orgasmically happy about a tent is something to worry about. “W.E.T,... in this? No way, I loooooove it. At 3 kilos after a zipper pull replacement, it is worth every ounce” My arms flail in full participation as if breaking into a happy dance before coffee over a tent is perfectly normal behavior. I utter as the manager uncomfortably grins, shifts his stance and takes a small step back. He turns and hurries off barely able to keep his flip flops on. Ooops...scared him... he either thinks there is a horney old maid trying to seduce him or that I'm some spastic over the hill lunatic with a fetish for tents...not sure which is worst I think to myself as I step through the huge tent door to spend the morning out of the rain, dry and comfy in my spacious sturdy tent thankful for my new sponsor Hilleberg! Your journey is the ultimate for testing tents for extreme conditions and durability! Thanks for sharing. I've been eyeing the Hilleberg tents for a few years - can't quite justify yet, need an epic long trip to pick the right one for that trip (bike, rowing, ...). Soon. Though you set a bar for epic that is beyond my dreams. Where will you be rowing? Converting a row boat into a pedal boat and cycling an ocean is always on my mind. I am forever looking for design ideas, any thoughts? Awesome that you now have Hilleberg as a sponser! Their tents are the greatest! We have one ourselves and it seems to be built like a tank. I love your stories, I can just picture the manager scurying away from you. Stay safe and hope the wind is at your back! We have a Hilleberg Kaitum 3GT. The height of luxury and bullet proof. We love it. All the best for your future plans - the sailing and the Americas. Have hiked in Patagonia and it is a magnificent part of the world. The hilleberg is my next tent.have seen lots of long haul biker with them a great home for a few yrs..tc enjoy your yurt. Hi Loretta, not sure about our Hilleberg tent. A nano 3G. 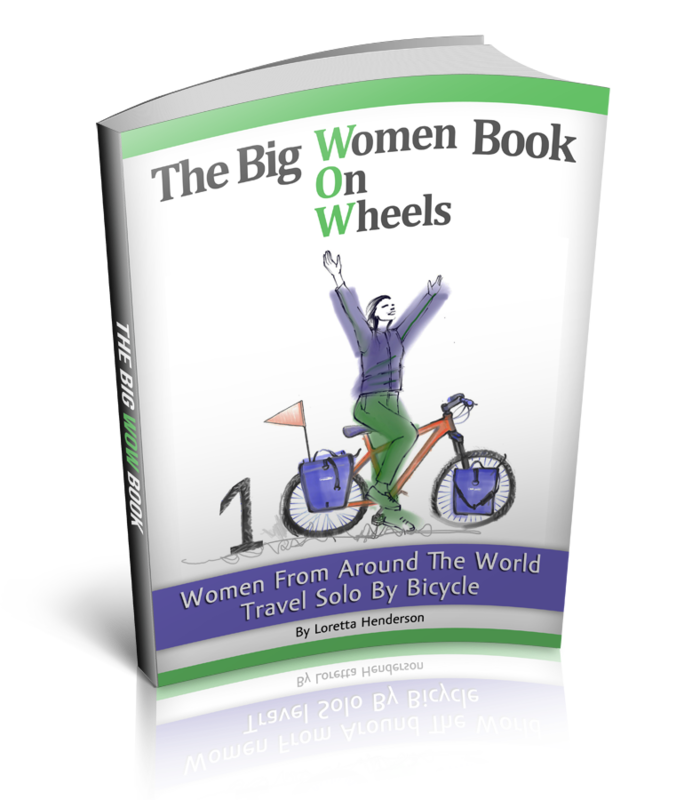 It is perfect for cycle touring in many ways - roomy, well designed entrances, footprint that extends into the big vestibule, lightweight..... But. After only 14 months of continual use, the fly seems to be getting very thin as though the UV rays are getting at it. We can see tiny holes in the sunlight, and when it rains there is a mist inside which seems more than just condensation. 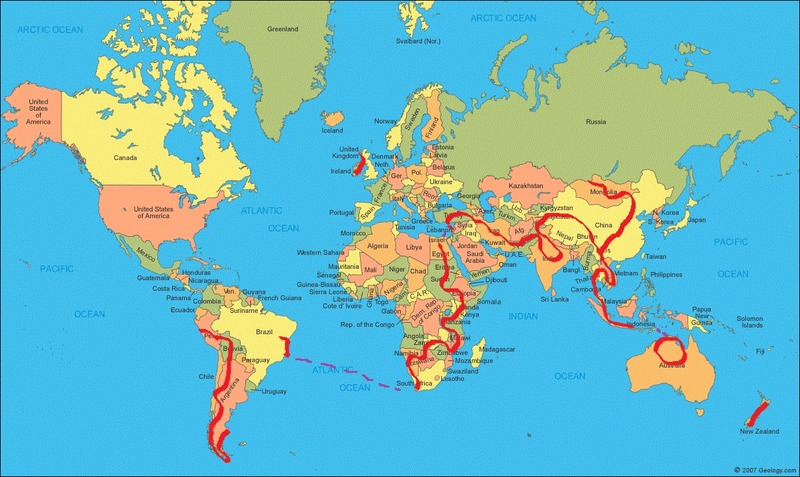 Have used it in a Europe and Pacific West Coast of USA where the UV is nothing like our home country - New Zealand. Also, two of the zips have caused problems although we have managed to fix them ( temporarily? ) by using pliers to pinch the sliders tighter on the zips. How did you find the Jannu in the long run? I am riding a dual suspension on a semi around the world tour and am looking at the Nallo 2 GT. Any thoughts on the Nallo? Cheers! Aha, I remember when you set up that Skyledge for the first time on the streets of Nicosia. Good to know what happens to ultra-lights after one year of use! I've been using a Nordisk (950grams) for a while and it's showing signs of use... Stretched seams and tears at stress-points.